Cortisol is a vital hormone that helps us deal with stress. Cortisol makes us active and mentally alert and, since it enters the brain to deliver glucose for energy, it also works to aid learning and memory. In times of stress, cortisol teams with adrenaline to balance our energy: It replenishes the body’s energy stores depleted by the “adrenaline rush” and converts the foods that we eat into storage forms, such as fat and glycogen. We need cortisol. It helps us spring out of bed in the morning to be mentally alert after a good night’s sleep. But to work well for us, we need cortisol to ebb and flow in its own natural rhythm—rising early in the morning, gradually diminishing throughout the day and evening to reach a low around midnight to allow us a full night of restful/restorative sleep. Unfortunately, our modern lifestyle—of late-night eating and activity, as well as daytime multi-tasking and lack of exercise—throws off the body’s natural cortisol clock. Eating and electronic stimulation from television and computers elevate cortisol. So, too, does chronic stress: Because the brain is linked to the endocrine system (through the HPA axis, the hypothalamus, pituitary, and adrenals) just thinking about a stressful situation, whether an important work deadline or the frustration of a traffic jam, elevates cortisol. Confined in an office or in the midst of a traffic jam, we have little opportunity to work off the energy mobilized by the stress response, so cortisol remains in our blood stream and tissues. Affects the brain and memory: Unlike adrenaline and insulin which do not cross the blood-brain barrier, cortisol can enter the brain where it delivers glucose for energy and aids memory by enhancing glutamate and promoting neuron “excitability”—but, too much leads to depression, exhaustion of nerve cells, and shrinking of the hippocampus (a key for memory). Sleep is by far the best way to manage stress. It does more to restore the body than yoga, meditation, or other stress-relieving activities1. Sleep is the body’s natural way to meditate. We might think of sleep as “vitamin S”…as essential as any micronutrient for ensuring health. Just as our soil is overworked and depleted of nutrients like the food that it grows, our modern hectic lifestyle erodes our vitamin S: In 1910, the average adult was still sleeping nine to ten hours a night. Now, the typical adult barely gets seven hours of shut-eye. And, it is not just a question of quantity but also quality: If evening cortisol levels are abnormally high, either from a day of chronic stress and/or late-night stimulation and eating, then sleep may be light and interrupted, with little nighttime sleep of the deep-restorative kind. When we do not get enough sleep or when our sleep is not coordinated with daylight, we throw off the natural timing and intricate balance of hormones, including serotonin, dopamine, and melatonin, as well as the neurotransmitters in the brain. While the intricacies of biochemistry are hard to follow, let alone to remember, we do not need to understand these concepts to learn how better to deal with stress. Instead, we can simply focus on cortisol—the major hormone associated with stress—and the lifestyle factors that can help control it so it works for, and not against us. What I hope you will take away from this newsletter is the visual picture (below) of the natural daily ebb and flow of cortisol. We want to strive to adjust daily habits, to the degree that we are able, in order to encourage these natural cortisol rhythms. Cortisol normally peaks in the early morning hours between 6 a.m. and 8 a.m., and it bottoms out around midnight. After reaching its early-morning peak, cortisol drops off sharply throughout the day, often leaving us with a dip in energy in late afternoon. The body is really programmed for a light dinner around 5 p.m., followed by an early bedtime about three hours later2. 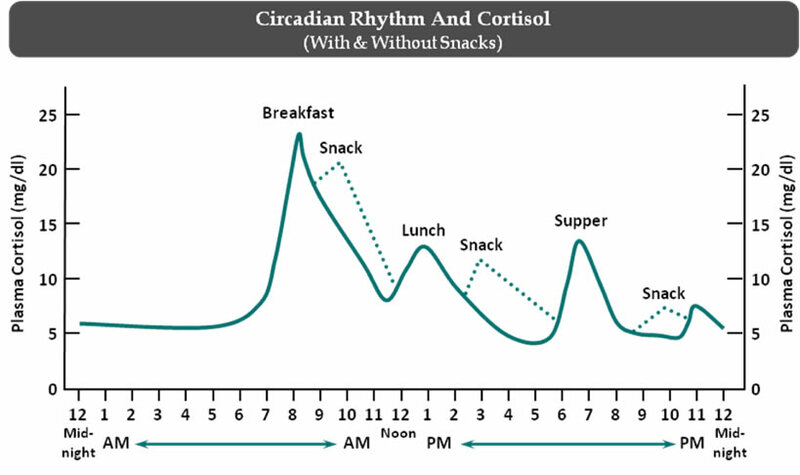 We can raise our cortisol and energy levels by eating meals (note the cortisol spikes around mealtime and snack breaks, which represent the impact of consuming food). Other factors that boost cortisol include exercise; stimulants such as caffeine; and, of course, stress, which can include actual situations that are stressful/frustrating, as well as the times when we simply think about and anticipate them. When I visualize this chart, I am inspired to eat a good breakfast, a hearty lunch and a lighter dinner. Regular meals and snacks help maintain cortisol levels throughout the day. The chart also suggests we might think twice about staying up late to finish emails or to watch the final exciting moments of a late-night sporting event. It also means trying to plan as many social times around breakfast and lunch rather than late dinners, since the body is best served by a light, early supper.